Paper: 4 sheets, 23cmx29cm with 3 wax seals, signatures and revenue stamp. Plan of property inside the front cover. Includes other sheets relating to land registry searches. The document begins by reciting that in January 1928 Henry Massey granted a 999 year lease to Samuel Ainge on a plot of land of 2266 square yards in Smith Street, St Helens. Then, in February 1928, Samuel Ainge mortgaged it to Henry Massey for £200. Since then, the plot appears to have been divided into six plots each with a house built on it. Three of these houses have since been sold to various purchasers during 1923. In this indenture, the house at number 1 Smith Street, is being sold to James Highcock for £385. Of this, £273 is being paid direct to Henry Massey to release the mortgage. 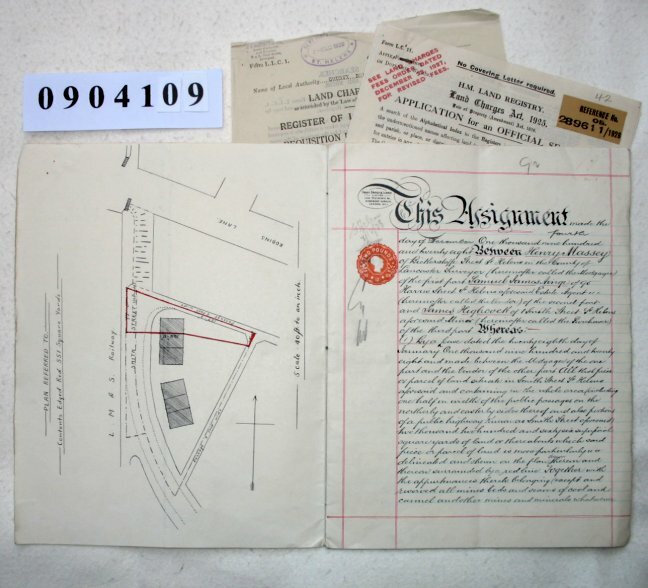 Some separate pieces of paper are included which relate to Land Registry searches made 4 December 1928 for the three names listed above who are party to this sale.